She was a passionate believer in social reform, a pioneer in the legal profession and a champion of women’s rights to rival Emmeline Pankhurst. But for Edge Hill graduate Helena Normanton, there is no statue in London or picture in the National Portrait Gallery to celebrate her achievements. So, why is this remarkable woman so overlooked in women’s history? Alumni Magazine spoke to Judith Bourne, who is writing her PhD on Normanton, to find out. “The sad truth is that very little is known about her,” says Judith, barrister and Senior Lecturer in Law at London Metropolitan University. “I teach a course on women and law and even I only came across her by accident. 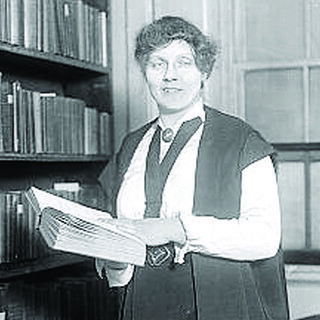 Helena Normanton was the first woman to practise at the English Bar in 1922, the first female barrister to lead the prosecution in a murder trial, to conduct a trial in America, and to represent cases in both the High Court and the Old Bailey. She was also one of the first two women, along with Rose Heilbron, to become Kings Council, the highest qualification awarded to a barrister. “It was very difficult for her because a lot of people wanted her to fail,” says Judith. “She faced discrimination from within the legal profession; many male solicitors refused to brief a female barrister, and she was the subject of vitriolic hate mail, some, seemingly, from other women in the profession. Very little is known about Normanton’s life before her legal career. She is known to have been a trainee teacher at Edge Hill, graduating in 1905, but how or why she came to be studying so far from her home town of Brighton is a mystery. Helena Normanton epitomises the spirit and ethos of Edge Hill that still exists to this day. The child of a working class single parent, with no family history of participation in higher education, Helena still managed to rise above her circumstances and succeed, thanks, in part, to her education at Edge Hill. The causes that she fought for – social justice, equal pay, women’s rights – are still important to Edge Hill and form the basis of some of the cutting edge research undertaken by staff at the institution today. This entry was posted in Magazines and tagged alumni, alumni magazine, helena normanton by Mike Nolan. Bookmark the permalink.